Oh My! 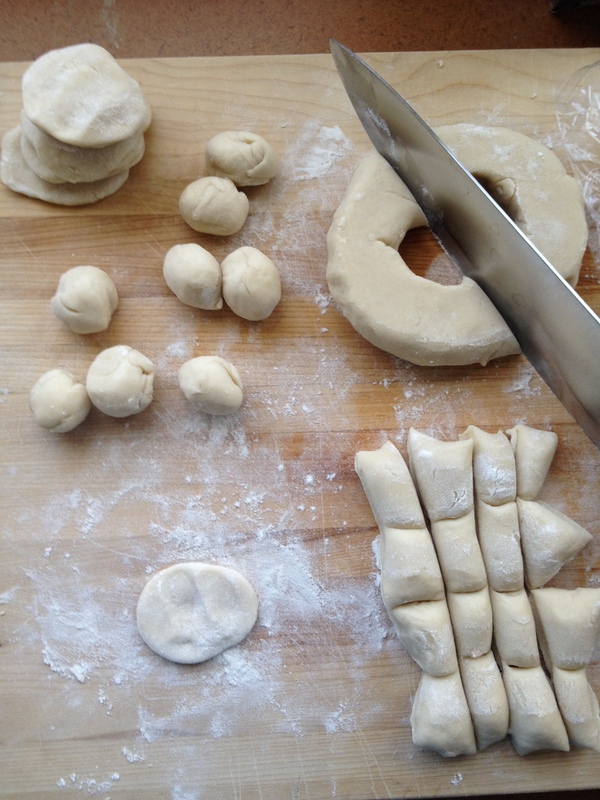 I was craving dim sum the other day so I looked at a few recipes for shu mai . I love those sweet/salty little dumplings with shrimp. They are so delicate in flavor. But, I have this concern….It’s shrimp. Americans eat a lot of shrimp. Too much I think. It’s not just a once-a-year shimp cocktail at Aunt Helen’s xmas gathering. With 700 or so Red Lobsters in this country, thousands of sushi and other seafood restaurants, and the amount of shrimp shipped to the U.S. from Asia, I can’t stomach it. I prefer my shrimp from the S/V Anne Marie in Louisiana. They use TED (turtle eluding devices), and the water as far as I can research, safe. Plus it is just right to support U.S. fishermen/women. I digress…. 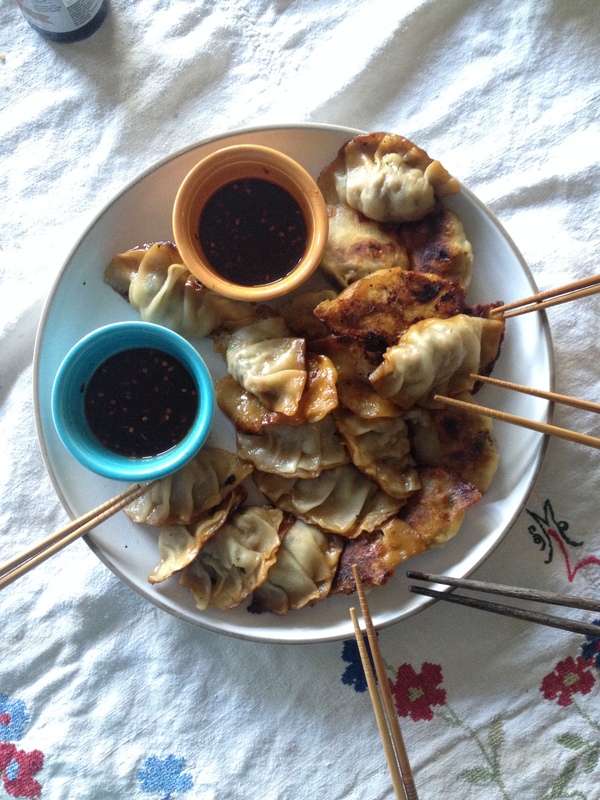 I decided to do a vegetarian version instead….It turned out well, but the real winners were the (pork) potstickers. 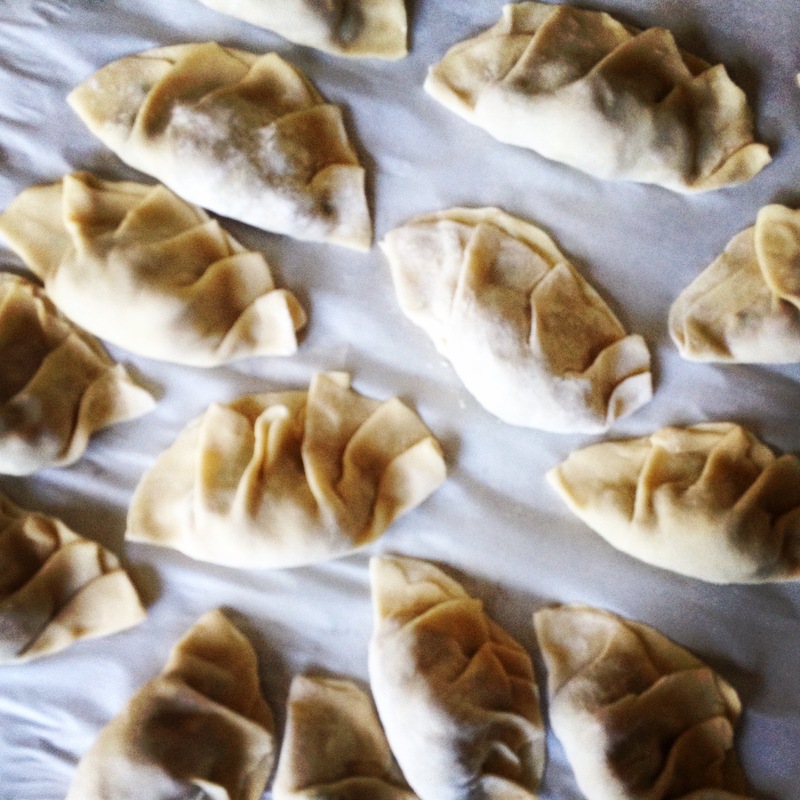 I made 25 potstickers with this recipe. Between 4 adults and 2 kids they were depleted in a matter of minutes. You can always skip the dough making and buy the skins at the market. BUT, you’ll have more unknown ingredients than are necessary. Also, this is the fun part. Kids can do this! Stir boiling water into the flour and salt, mix well and put all on a wood board and knead for 10-15 minutes. I’m a big fan of this time. Meditation time with your hot ball of dough. So relaxing for the mind. cut in half. make a long sausage or donut out of each piece of dough and let rest for at lease 30 mins. (See image below). 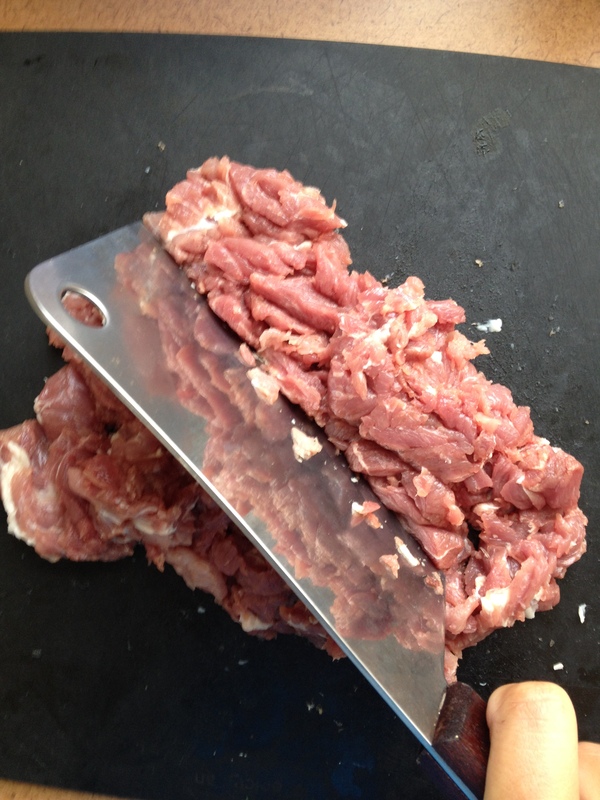 With the pork…Buy a cut of pork shoulder and have your butcher cut the fat off and grind it there, OR take your piece home and get out all your aggression. Watch your fingers! I like to pick through mine and get most of the fat off, then act as if I’m in a terrible “B” movie. Agghhh! 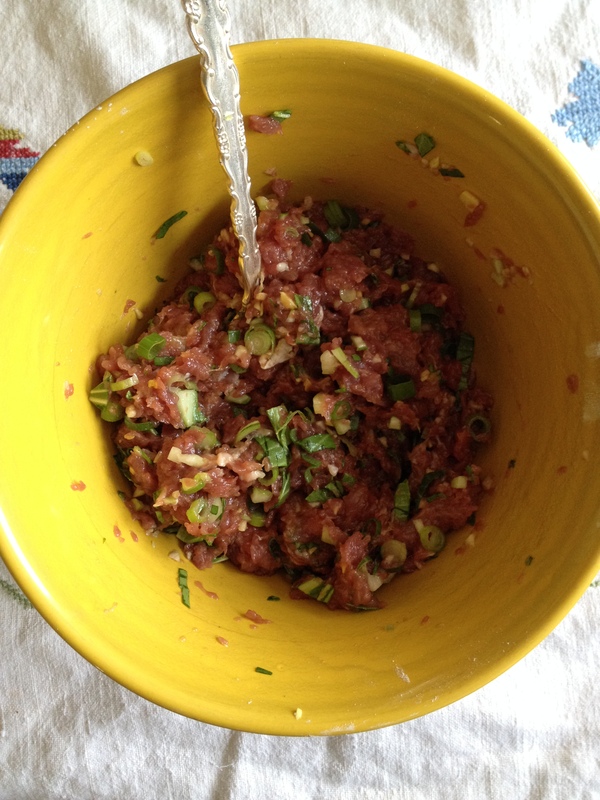 Mix all your ingredients in a bowl. Cut each donut in half, then half again, then half again. 16 pieces. Round each piece into a ball, flatten it into a disk, then using a small rolling pin (I use a pestle), turn and roll your way to make the disk about 3″ round. Note: nothing has to be perfect. Cooking is art! Place your dough disk in your hand, slightly cupped. Spoon a bit of pork mixture in the center. Pinch the right corner with your right hand (opposite this if you’re left handed). 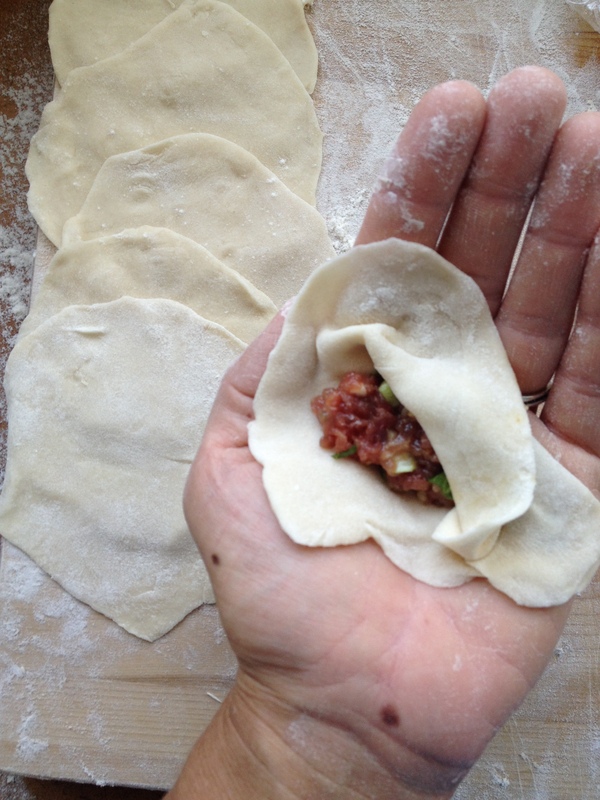 Take the top flap and fold it to a pie crease and meet the bottom, and continue…Fold, meet, food, meet…Pinch down the other side and place your finished dumpling art on a lined cookie sheet until you are ready to cook. Heat up a skillet about medium heat, pour in a little vegetable oil. I use a high quality Peanut oil. You can use Olive oil, but you have to keep it a lower temperature so not to burn, otherwise toss the burning oil, wipe down the skillet, and start over. Place the potstickers in the oil and let cook until you see them turning golden brown on one side. Don’t move them, just leave them be. the browning should take about 5 minutes. Then, add about a 1/2 C. of water to the skillet and cover. When the water has evaporated they are done! YuM! Please let me know if you try this recipe. I encourage folks to try a vegetarian version, But be careful about the amount of wetness. If there is a lot of wetness it will make the dough pasty and tear before you cook it…Very frustrating.